There are sometimes when someone has a dream project in mind which he/she believes to execute once they will have enough resources to do that. Same seems to be the case with the film- A Flying Jatt directed by Remo D'Souza. It seems as if Remo always wanted to make a movie on Superhero and therefore without having any kind of script or something related to that, he just went on making this badly executed Superhero movie which shamelessly plays for next 2.5 hours like a spoof of itself. In the quest of trying something new in the genre by showing the protagonist scared of heights and dogs and still being a Superhero who flies only at the height of 10-15 feet from the ground, he ends up riding too much upon such kind of silly jokes. The formation of a normal clueless boy into a Superhero has been described so minutely in the first half of the movie that at one point I felt that at the end of 2.5 hours, the Superhero will finally emerge on the screen with the caption- "To Be Continued". The way power is been given to him, the way costume is designed for him, the way he starts flying outside and helping others etc is given too much screen time than the main plot of the movie. Also, this movie tries to be too preachy in the 2nd half which kills the interest to watch it anymore. It looks like an advertisement of Swachh Bharat Abhiyaan and many Modi-haters might end up saying that Mr. Narendra Modi have invested in this project to promote himself. Even the climax is so silly that I do not believe that even kids would love it. The VFX is so bad that you'll want to ask the makers what made them release this scene even after seeing how badly executed these scenes look on the screen. 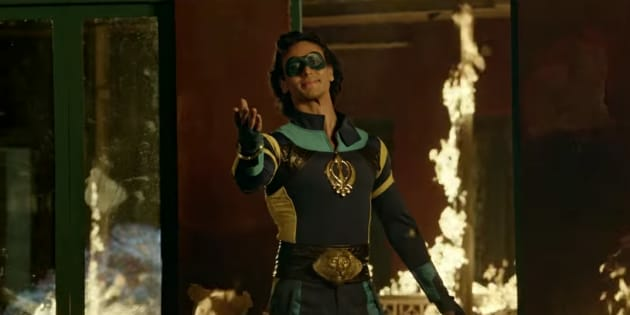 Talking about the performances, Tiger Shroff have tried very well to execute things but it seems director asked him to over-act in this movie as every actor needs a movie in his initial phase which can be referred as the one in which he over-acted. Jacqueline is totally wasted. She is only for the songs and that little love angle that is added in the movie. Gaurav Pandey is okay. Amrita Singh has again played a loud Punjabi mom character just like 2 States. So nothing new even here. Nathan Jones looks stupid in each and every scene. Kay Kay Menon has also walked sleepily in this movie that makes a total fun of itself in each and every scene. Just avoid this stupid Superhero movie like we avoided Drona. I give this movie 0.5 stars and I do not know for what.